Auction houses worldwide make up a multi-billion-dollar industry that sellers use as a means of divesting anything from single items to entire collections. The Q&A below provides an overview of the ins and outs of buying and selling at auction and what makes auction one of the best ways to both disperse and acquire material. What is an auction and how is it different than other means of selling? When a collector decides to deaccession material, there are many options, including passing works down through the family, donating to a museum or non-profit, selling through a dealer, selling privately, and selling at auction. Technically speaking, an auction is a public sale in which items are sold to the highest bidder through competitive bidding and the bidding process is certainly the issue that distinguishes an auction. An auction estimate has been determined by a specialist and bidders from around the world are allowed to bid competitively until only one bidder remains. When the auctioneer has determined that all of the other bidders are through bidding, the lot will be awarded to the winning bidder at the final price that was bid. Auctions have been a way to divest collections for millennia. Auctions were held in antiquity and the business model of an auctioneer selling to the highest bidder has changed little in the last two thousand years. It is a tried-and-true method that awards the highest bidder in a fair market and the prices achieved are public knowledge, which makes selling at auction completely transparent. Based on the competitive bidding, auctions can often help create the highest potential price for a particular work of art. It is the job of the auction house to provide expertise on the value of each auction lot, but it is also the responsibility of the house to identify potential buyers for each piece. The frenzy of an auction has created bidding wars countless times throughout history and this has led to some of the greatest prices realized for any objects ever sold. In addition to the historical business model and expertise that an auction house provides, it is also a very straightforward consignment process with competitive commission structures. Our standard commission for items that sell over $1,000 is 15%, which is a reasonable fee when compared with some of the other options that collectors have. 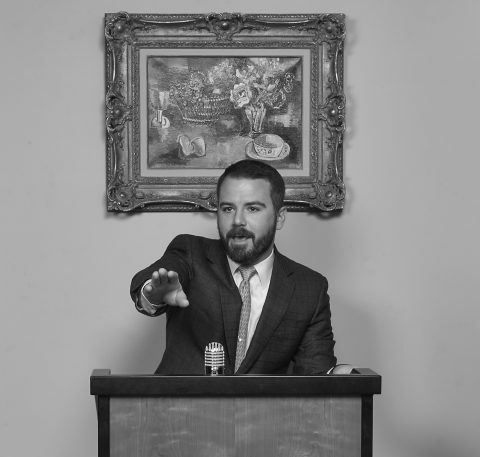 I feel that buying at auction is often viewed as an intimidating process where a ruthless auctioneer will sell to a winning bidder who scratches his or her nose. Of course, this is cliché and inaccurate. Buying at auction is an exciting, thrilling, and fair way to purchase art and helps serve collectors in all price points. Auctions worldwide cater to both beginners who are buying their first painting and to seasoned collectors who buy and sell art on a daily basis. Prices at auction can range from $200 up to the eyebrow-raising $450 million paid for Leonardo da Vinci’s Salvator Mundi in 2017. Auction is also a trusted way to purchase art as all of the lots sold have been vetted by auction specialists who live and breathe the material. How can I attend an auction? Most auctions are open to the public, including auctions held at Toomey & Co. Auctioneers. If you are interested in attending an auction, it is easy to sign up for a paddle the day of the sale. Personally, I feel that, if at all possible, bidding live during an auction is still the most secure and exciting way to bid. Technology has certainly made it possible for a large majority of bidders to bid remotely, but we would love to see more clients in the room and I am sure that my colleagues at other houses feel the same. If you can’t attend an auction in person, you have a number of options, including leaving an absentee bid prior to the auction, signing up to telephone bid during the sale, or participating via an online platform that allows you to bid in real time from your home computer. Toomey & Co. Auctioneers typically has four to six auctions per year. If you are interested in finding out more, I would suggest speaking with one of our specialists and joining our mailing list (see form below), which will keep you updated on exciting material that we have to offer. How do I find out if a piece from my collection has value at auction? The easiest way to find out if an artwork from your collection has value is to call or email Toomey & Co. Auctioneers with all of the information you have on the piece or the entire collection. We will likely be able to provide preliminary estimates based on photographs of the collection, but in some instances it is more beneficial for a member of our staff to see the pieces in person. Once we have had an opportunity to view the works, it should take anywhere between 24 hours and two weeks for Toomey & Co. to provide our expertise. The time will depend on how much material is in the collection and how much research is necessary. The auction estimates that we provide will be based on a number of criteria including the artist, the subject matter, the medium, the rarity, the provenance, and the condition of the work.